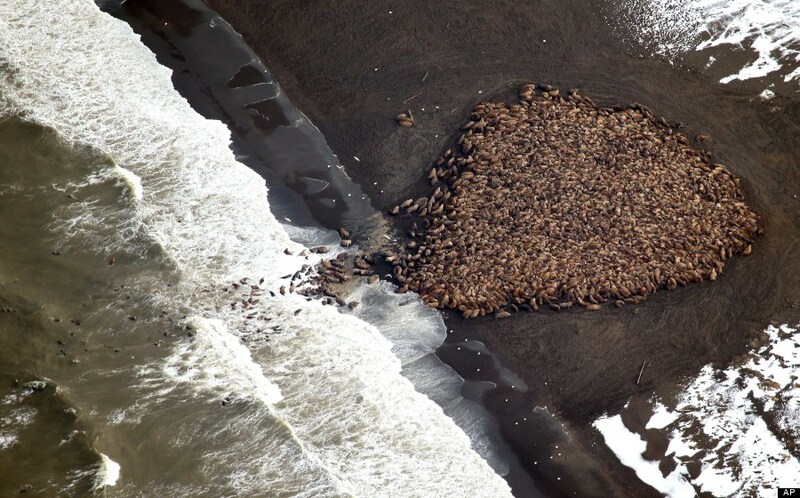 Pacific walrus that can’t find sea ice for resting in Arctic waters are coming ashore in record numbers on a beach in northwest Alaska. An estimated 35,000 walrus were photographed Saturday about 5 miles north of Point Lay, according to the National Oceanic and Atmospheric Administration. Point Lay is an Inupiat Eskimo village 300 miles southwest of Barrow and 700 miles northwest of Anchorage. 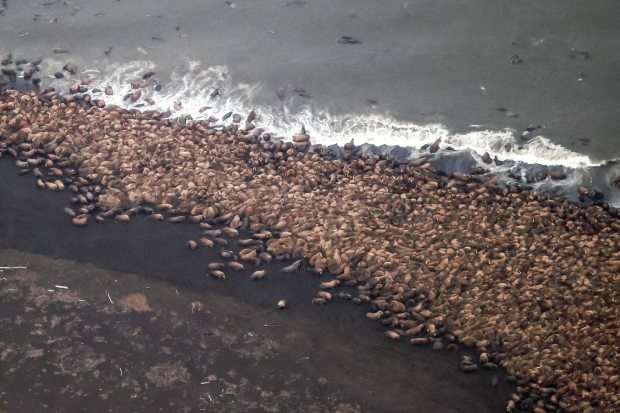 The Federal Aviation Authority has re-routed flights, and local communities have called on bush pilots to keep their distance in an effort to avoid setting off a panic that could see scores of walruses trampled to death, federal government scientists told reporters. 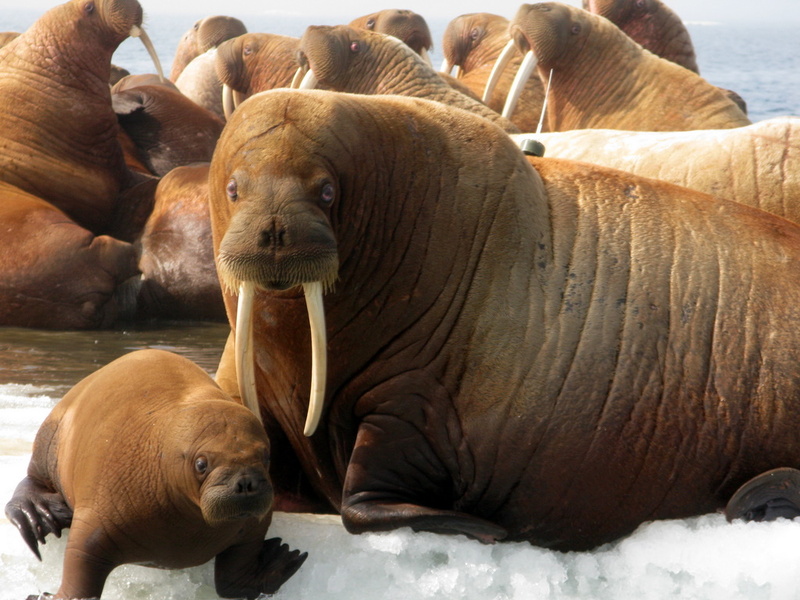 Baby walrus are most at risk during a stampede and are easily crushed by adults. U.S. Fish and Wildlife Service, said walrus were first spotted Sept. 13 and have been moving on and off shore. Observers last week saw about 50 carcasses on the beach from animals that may have been killed in a stampede, and the agency was assembly a necropsy team to determine their cause of death. As temperatures warm in summer, the edge of the sea ice recedes north. Females and their young ride the edge of the sea ice into the Chukchi Sea, the body of water north of the Bering Strait. 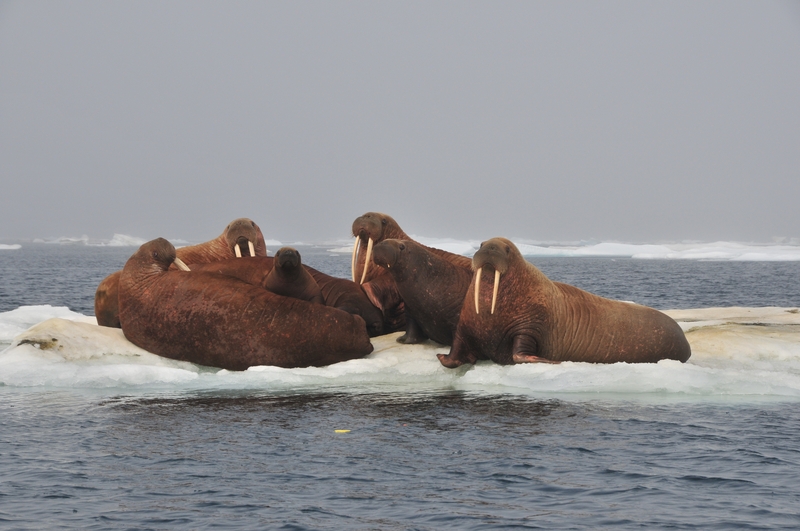 In recent years, sea ice has receded north beyond shallow continental shelf waters and into Arctic Ocean water, where depths exceed 2 miles and walrus cannot dive to the bottom.